In recent years people have become more aware of the benefits of horse powered land management. Work can be carried out with minimal impact on sites that are environmentally, ecologically or archaeologically sensitive. Problems with access may be solved by using horses rather than machines. The use of horse power ensures that carbon emissions are kept to a minimum. Land Management – We have been working on a variety of environmental projects with excellent results. Horse-powered cutting, harrowing, rolling and fertilizing will improve and maintain your pasture. It will also encourage wild flowers, bees and butterflies while discouraging parasites. Land management is one of the most rewarding jobs I do. My horses enjoy the work and it reinforces the bond I have with them. I would be pleased to train you and your horse in these skills or to provide you with a quote for doing the work with my horses. Horse-powered bracken bruising – or bracken bashing as we used more fiercely to call it – is a cost-effective, eco-friendly means of postponing the day when bracken takes over the planet. The work is best done between June and August with at least two further bashes in the next two years to finish the job. Heavy horse power was brought in to move two giant oak trees at a woodland nature reserve near Guildford. The 200-year-old oaks, which were blown down in storms in March, are destined for use in the restoration of a local boardwalk. 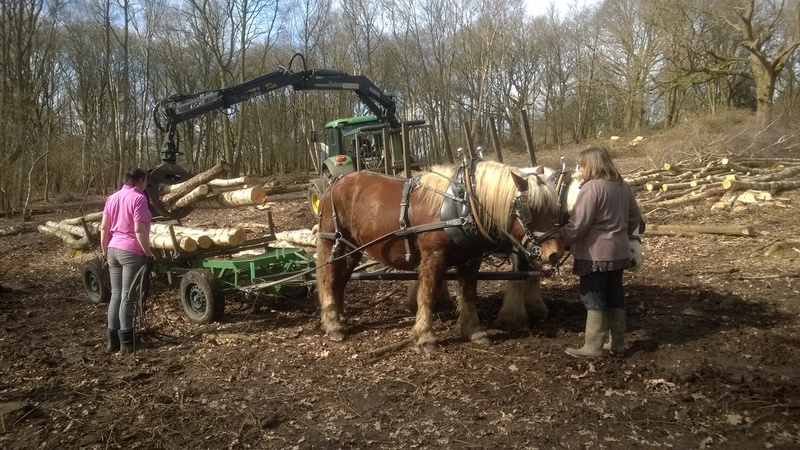 Surrey Hills Horseman Daniel Brown and his comtois horse Tooky worked in perfect harmony as they tackled the removal job at Cucknell’s Wood – a Surrey Wildlife Trust site near Shamley Green, Guildford. As a crowd of volunteers and locals looked on, Tooky flexed his muscles to shift two tonnes of solid English oak – the traditional way. 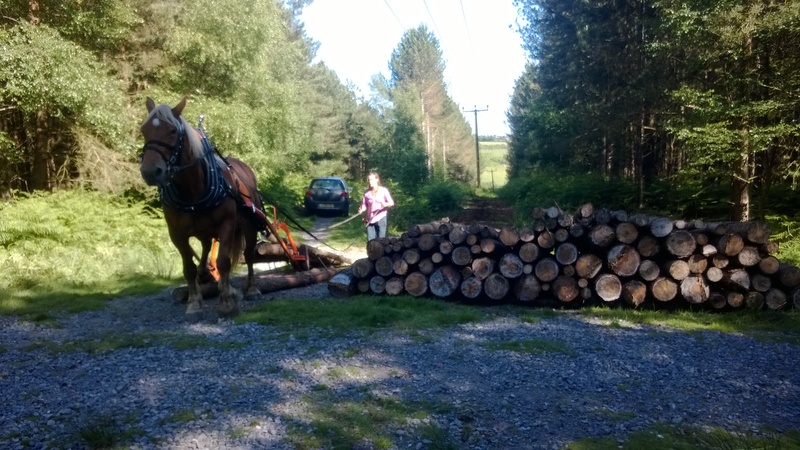 Trust Ranger Leo Jennings said horses had been chosen rather than heavy machinery, because of their minimal impact on the ancient woodland and ability to access tricky sites. “The ideal solution for ancient woodland sites with soft soil is heavy horses,” he said. “These gentle giants can turn on the spot, they have an infallible traction control system, they can step over obstacles and they do not wheel-spin! The huge oaks will now be processed at the Trust’s own sawmill at Norbury Park, near Dorking, before being used to rebuild a rotting boardwalk at the Trust’s nature reserve on Chitty’s Common, near Guildford. “It’s really rewarding to see a fallen oak put to good use,” added Leo. “These trees, which have grown in a Surrey Wildlife Trust woodland, will be processed at our own sawmill at Norbury Park, then used to repair a boardwalk at one of our nearby nature reserves – it’s a fantastic example of sustainable forestry. The Chitty’s Common improvement works have been made possible with a grant of £12,000 from the Tesco supermarket’s ‘Bags of Help’ scheme. The main aim of the project is to rebuild the dilapidated boardwalk, which will give visitors much better access. The scheme also includes some tree safety work and ditch management to alleviate local flooding, as well as the removal of non-indigenous species such as Japanese knotweed. Land Management Quote: Please contact me for prices and further information.